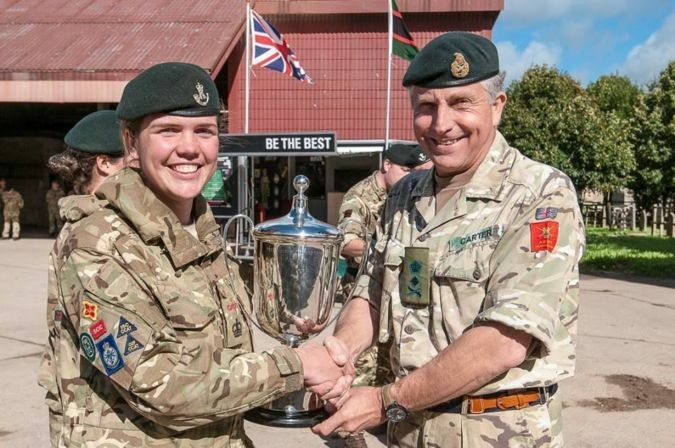 Over the weekend of 23-25 September 120 cadets from Rifles badged Army Cadet Force (ACF) detachments from across the country gathered on the Salisbury Plain Training Area for the ninth annual Rifles Cadet Cup Competition, hosted by the Regiment. This year 12 county teams, each of 10 cadets escorted by Adult Volunteers, took part in the two day challenge covering a distance up to 20km. The two-day exercise provided cadets with an opportunity to challenge themselves with a series of physically and mentally demanding tests. Throughout the competition the cadets participated in a patrol exercise where they were tested on aspects of the Army Proficiency Certificate Syllabus in tactical scenarios. During Day One of the patrol the cadets demonstrated their knowledge of self-reliance and unit identity whilst using their teamwork, leadership, navigation, medical and fieldcraft skills. After an overnight stay in the Urban Operations Training Facility, Copehill Down Village, the cadets moved into Day 2 with a 0600hrs start. During Day Two, the cadets took part in an elementary obstacle crossing exercise, incorporating the need of a speedy equipment resupply, air rifle range, navigation and military knowledge theory, along with a test on bugle calls (used by The Rifles as a means of communication on the battle field for centuries). The Colonel Commandant of The Rifles (and Chief of the General Staff), General Sir Nicholas Carter KCB CBE DSO ADC Gen, was on hand to present the awards, with the winners of the National Cadet Cup and Southern Champions awarded to Wiltshire ACF. Somerset ACF came home in a close second place, with third place and the Northern Champions going to Shropshire ACF. Cadet CSM Reavill, from the winning Wiltshire ACF team on The Rifles National Cadet Competition 2016, also won the Best Cadet award. She is pictured receiving her award from General Sir Nick Carter KCB CBE DSO ADC Gen, the Chief of the General Staff (CGS). A fuller report and more pictures are available.